PhD in History (Georgetown University, Washington D.C.): 1995, FRHisS. I am interested in hearing from students eager to embark on doctoral studies in early modern Polish-Lithuanian, East Central European and German history, on all the research interests above. Pietro Omodeo (ed.) in collaboration with Karin Friedrich, Duncan Liddel (1561-1613) Networks of Polymathy and the Northern European Renaissance (Leiden: Brill, 2016). (editor and introd. ), Die Erschließung des Raumes: Konstruktion, Imagination und Darstellung von Räumen und Grenzen im Barockzeitalter (Wiesbaden: Harrassowitz, 2014), Wolfenbütteler Arbeiten zur Barockforschung, 2 vols, 920 pp 123 illustr. The Cultivation of Monarchy and the Rise of Berlin. Brandenburg-Prussia 1700 (Ashgate, 2010). This is part monograph, part edited collection of materials relating to the coronation of Prussia in 1701, useful for students and specialists of festival, court culture and the rise of the cultural and political capital of Berlin during the early eighteenth century. (ed.) Citizenship and Identity in a multinational Commonwealth. Poland-Lithuania in Context, c. 1550-1772 (Brill, 2009) results from the last of the Sawyer seminar series, funded by the Andrew Mellon Foundation, at the University of Aberdeen's Centre of Early Modern Studies, held in 2005. The Polish translation of my first monograph, The Other Prussia. Prussia, Poland and Liberty, 1569-1772 (Cambridge UP, 2000), appeared in Poznan, 2005 under the title Inne Prusy. Europa triumphans: court and civic festivals in early modern Europe (Ashgate, 2004) vol. I, ed. by Ronnie Mulryne et al., includes my section on Festivals in Poland-Lithuania, pp. 373-454. As editor of Geman History, from 2001-2006, I also edited the 2004/3 special issue on 'Polish Views of German History'. After studies of Modern and Early Modern History, East European History and Political Sciences in France, Munich, Washington D.C. and Poland, and a doctorate from Georgetown University, Karin Friedrich held the post of lecturer and then senior lecturer at the School of Slavonic and East European Studies, University of London/University College London, where she was a member of the History Department from 1995 to 2004. In the spring/summer of 2000, she held a visiting chair at the Free University, Berlin. Holding a Leverhulme Fellowship in 2000-2001, several travel, conference and small grants from the British Academy and other organisations, and an AHRC research grant in 2011-12, she has widely published on the history of Poland-Lithuania, Prussia, social and cultural history, court culture, history of religion and political ideas. From 2001-2006 she was co-editor of the peer-reviewed journal German History. She joined the University of Aberdeen as a senior lecturer in January 2005, where she has been co-director of the Centre of Early Modern Studies and an active collaborator in the Centre for Citizenship, Civil Society and the Rule of Law. She is a fellow of the Royal Historical Society and has recently (2015) been elected to the RHS Council. She a member of the AHRC peer review college, the Carnegie Trust's Assessor College and serves on many editorial and editorial advisory boards. During 2002-2013 she was a member/deputy chair of the academic advisory board of the German Historical Institute Warsaw and a member of the Arbeitskreis für Barockforschung at the Herzog August Library in Wolfenbüttel. She was promoted in 2013 to a professorship in Early Modern European History. She teaches on a wide range of undergraduate courses and coordinates the postgraduate MLitt programme in Early Modern Studies at Aberdeen. She has several PhD students in Polish and Lithuanian history and welcomes supervision of topics in the social, political, cultural and intellectual history of Central Europe (esp. Brandenburg-Prussia, Poland-Lithuania and the Holy Roman Empire) from the sixteenth to the early nineteenth century. My research focuses on the German-Polish borderlands in the context of early modern Europe and issues of cultural transfer, citizenship, religous and political identities, and the constitution of early modern comonwealths. My doctoral work and first book was on urban elites (mostly German-speaking and Protestant) in Polish Prussia, and their historical and national identities in the context of a noble-dominated Polish-Lithuanian Commonwealth. Further interests and publications have focused on the history of political and religious ideas in early modern Central Europe, early modern identities and urban history, the history of Silesia, Cracow and Prague and confessionalisation in Poland-Lithuania in their European context from the Renaissance to the Enlightenment. My interess in Polish-Lithuanian and German history of the early modern period also include court and festival culture, interest in the rival political systems of absolutist Brandenburg-Prussia and the mixed form of constitutionally limited monarchy in Poland. As co-director of the Centre for Early Modern Studies I am interested in supporting interdisciplinary research on early modern Europe. I have a particular interest in the notion and meaning of citizenship in the early modern period and closely cooperate with the University of Aberdeen's Centre for Citizenship, Civil Society and the Rule of Law (CISRUL). My research continues to concentrate on the borderlands of Poland-Lithuania, Prussia and Germany. After receiving funding from the AHRC (in 2011-12) for archival rearch in Warsaw, Berlin, Vilnius and Minsk, I am currently writing a monograph (contracted wth Routledge) on the the Lithuanian magnate and governor of Prussia Boguslaw Radziwill, a truly transnational figure. I analyse his political and religous (Calvinist) patronage networks, his family policies, his changing allegiances between Poland-Lithuania and Prussia, and his loyalties in political, religious and cultural terms. 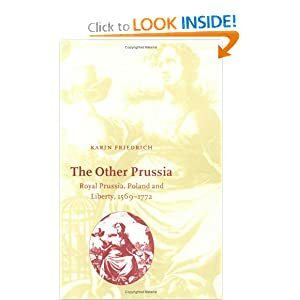 My last monograph was new interpretation of Prussian history (Brandenburg-Prussia 1466-1806: The Rise of a Composite State, Palgrave Macmillan, 2011), accessible to students and a wider readership, locates Brandenburg-Prussia within East Central Europe as well as the German context of the Holy Roman Empire and provides a synthesis of approaches, debates and recent research. The Cultivation of Monarchy and the Rise of Berlin: Brandenburg-Prussia 1700, with Sara Smart (Farnham: Ashgate, 2010). The Other Prussia. Poland, Prussia and Liberty, 1569-1772 (Cambridge University Press, 2000, pb 2006) 280 pp. (ed.) Pietro Omodeo in collaboration with Karin Friedrich, Duncan Liddel (1561-1613) Networks of Polymathy and the Northern European Renaissance (Leiden: Brill, 2016). (ed.) Festivals in Germany and Europe: New Approaches to European Festival Culture (Lewiston, Queenston, Lampeter: Edwin Mellen Press, 2000) 396 pp. German History 22:3 (2004), editor of special issue: 'Polish Views of German History'. Obywatele i obywatelskość w wielonarodowej Rzeczypospolitej’ [Citizens and Citizenship in a multi-natinal Commonwealth], in: Dyskurs polityczny Rzeczypospolitej w dialogu z tradycją europejską. Struktury aksjologiczne – praktyka komunikacyjna – granice cywilizacyjne, ed. Anna Grześkowiak-Krwawicz (Warsaw: University of Warsaw Press, 2016), 30 pp. ‘Cultural capital, self-representation and patronage in the Polish-Lithuanian Commonwealth: the Example of the Radziwill family’, in: Medieninnovationen im Nordeuropa des 17. Jahrhunderts. Media Innovations in 17th-century Northern Europe : Wolfenbütteler Arbeiten zur Barockforschung, ed. by JohannesSüßmann, Sabine Schmitz, Christoph Ehland (Wiesbaden: Harrassowitz, 2015 forthcoming). 'Die Reformation in Polen-Litauen', [The Reformation in Poland-Lithuania] (Chapter 2.f. ), in: Polen in der europäischen Geschichte. Ein Handbuch in Vier Bänden, general ed. Michael G. Müller, vol. ed. Hans-Jürgen Bömelburg, vol II: Die Frühe Neuzeit [The Early Modern Period] (Hiersemann-Verlag, Stuttgart, 2011), by subscription, Lieferung 2, 123-143. 'Von der religiösen Toleranz zur gegenreformatorischen Konfessionalisierung: Konfessionelle, regionale und ständische Identitäten im Unionsstaat' [From religious toleration to counter-reformationist confessionalisation: confessional, regional and social identities in the Polish-Lithuanian union] (Chapter 3.d. ), Polen in der europäischen Geschichte. Ein Handbuch in Vier Bänden, general ed. Michael G. Müller, vol. ed. Hans-Jürgen Bömelburg, vol II: Die Frühe Neuzeit [The Early Modern Period] (Hiersemann-Verlag, Stuttgart, 2012), 251-289. ‘Introduction’ to Citizenship and Identity in a Multi-National Commonwealth. Poland-Lithuania in Context, 1550-1750 (Leiden: Brill, 2009), 1-16. 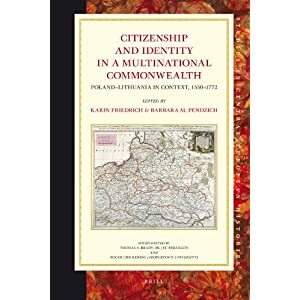 ‘Citizenship in the Periphery: Royal Prussia and the Union of Lublin 1569’, in Citizenship and Identity in a Multi-National Commonwealth. Poland-Lithuania in Context, 1550-1750 (Leiden: Brill, 2009), 49-70. 'Poland-Lithuania', in History of European Political Throught, 1450-1700, eds. Howell Lloyd, Glenn Burgess, Simon Hodson (Yale University Press, 2007), 208-242. 'History, Myth and Historical Identity', James B. Collins, Karen L. Taylor (eds), Early Modern Europe: Issues and Interpretations,, Oxford: Malden, 2006, pp. 41-54. 'Zwischen zwei Adlern. Kulturelle und ideologische Einflüsse Polen-Litauens auf das herzogliche Preußen vor 1701' [Between Two Eagles. Cultural and ideological influences of Poland-Lithuania on Ducal Prussia], in: Preußen in Ostmitteleuropa [Prussia in East Central Europe], ed. by Matthias Weber (Oldenburg, 2003), pp. 115-141. 'The Development of Prussian Towns, 1720-1815', in P. Dwyer, ed., The Rise of Prussia: Re-thinking Prussian History, 1700-1830, (London: Adison, Wesley, Longman, 2001), pp. 129-150. 'Cultural and Intellectual Trends', German History Since 1800, ed. by Mary Fulbrook (London: Edward Arnold, 1997), pp. 88-105. Introduction to Festivals in Germany and Europe: New Approaches to European Festival Culture (Lewiston, Queenston, Lampeter: Edwin Mellen Press, 2000), pp. 1-15. 'Cives Patriae - 'German' Burghers in the Polish-Lithuanian Commonwealth', in R. Bartlett, K. Schönwälder, eds., Germany and the Eastern Lands (London: Macmillan, 1998), 48-71. 'Gottfried Lengnich (1689-1774) und die Aufklärung in Preußen königlich-polnischen Anteils', in Fördern und Bewahren. Studien zur Europäischen Kulturgeschichte der Frühen Neuzeit, edited by H. Schmidt-Glintzer (Wiesbaden: Harrassowitz-Verlag, 1996), 107-118. Rola i znaczenie Prus Królewskich w życiu politycznym i intelektualnym Rzeczypospolitej w XVIII wieku, szczególnie w dobie reform ustrojowych’ [The role and significance of Royal Prussia in the political and intellectual life of the eighteenth-century Polish-Lithuanian Commonwealth, particularly during the era of reform], in: Pamięć „Chwili, Która Nas Samym Sobie Wróciła...” Wykłady Trzeciomajowe w Trybunale Konstytucyjnym w latach 2000-2015 (Warsaw, Publications of the Constitutional Tribunal, 2016, 214-237. Life-writing in the Polish-Lithuanian Commonwealth: Reflections on Magnate Ego-Documents, Dekonstruieren und doch erzählen. Polnische und andere Geschichten, ed. by Jürgen Heyde, Karsten Holste, Dietlind Hüchtker, Yvonne Kleinmann, Katrin Steffen. Poland: Culture - History – Society, vol. 2 (Göttingen: Wallstein Verlag, 2015), 81-86. ‘Noble power brokerage in the Polish-Lithuanian Commonwealth: the case of Boguslaw Radziwill’, in: Miscellanea res Polonorum, Brittanorum ac Judaeorum illustrantia, edited by Jakub Basista, Adam Kazmierczyk, Mariusz Markiewicz and Dominika Oliwa (Cracow: Historia Jagiellonica 2015), 13-26. '"Pomorze" or "Preussen": Polish Perspectives on early modern Prussian History', German History 22:3 (2004), special issue: 'Polish Views of German History', pp. 190-217, and Introduction (co-authored with Klaus Zernack), pp. 155-168. 'Kilka zagadnien nad historia miast w Prusach Królewskich i Prusach Hohenzollernów w XVIII wieku [Reflections on the history of towns in Royal and Hohenzollern Prussia in the eighteenth century]', in Miedzy Wschodem a Zachodem [Between East and West], edited by Jaroslaw Porazinski, Jaroslaw Dumanowski and Krzysztof Mikulski (Torun: UMK, 2002), pp. 277-285. 'Nationsbewußtsein im Schlesien der frühen Neuzeit' [National identity in early modern Silesia], in: Die Grenzen der Nationen. Nationale Identitätenwandel in Oberschlesien in der Neuzeit, edited by Kai Struve and Philip Ther (Marburg: Herder-Institut, 2002), pp. 19-44. 'Royal Prussia: Monarch, Nobles and Cities', in Richard Butterwick (ed. ), The Polish-Lithuania Monarchy, 1500-1795 (London: Palgrave, 2001), pp. 93-115. 'Cives Cracoviae: Bürgertum im frühneuzeitlichen Krakau zwischen Stadtpatriotismus und nationaler Pluralität', in Marina Dmitrieva and Karen Lambrecht (eds), Krakau, Prag und Wien. Funktionen von Metropolen im frühmodernen Staat (Stuttgart: Franz-Steiner Verlag, 2000), 143-162. 'Konfessionalisierung und politische Ideen in Polen und Litauen, 1570-1650' , in Konfessionalisierung in Ostmitteleuropa. Wirkungen des religiösen Wandels im 16. und 17. Jahrhundert in Staat, Gesellschaft und Kultur, eds J. Bahlcke and A. Strohmeyer Stuttgart: Franz Steiner Verlag 1999), 249-266. 'Nationale Identität und Pluralität in Krakau und Prag im 16. Jahrhundert', Berichte und Beiträge des Geisteswissenschaftlichen Zentrums für Ostmitteleuropa (Leipzig: Geisteswissenschaftliches Zentrum für Ostmitteleuropa, 1999), 60-79. 'The Urban Enlightenment in Eighteenth-Century Royal Prussia', Raison universelle et cultures nationales au siècle des lumières, ed. by David Bell, L. Pimenova, S. Pujol (Paris, Geneva: Edititons Champion, Slatkine, 1998), 11-29. 'Politisches Landesbewußtsein und seine Trägerschichten im Königlichen Preußen, 1466-1772/95)' (Regional Political Identity and Social Strata in Royal Prussia), Nordost-Archiv 2 (1997), 541-564. 'Better in Perilous Liberty Than In Quiet Servitude. The Idea of Freedom in the Writings of Two Protestant Burghers in Seventeenth Century Royal Prussia', in: Miedzy Wielka Polityka a Szlacheckim Partykularyzmem. Studia z dziejów nowozytnej Polski i Europy, (Festschrift in Honour of Professor Jacek Staszewski on the occasion of his sixtieth birthday) (Torun University Press, 1993), 71-85. 'A Conservative Revolution Against Hitler. Edgar Julius Jung's Analysis and Criticism of the Total State', in Totalitarianism and the Challenge of Democracy, ed. by A.W. Jablonski and W. Piasecki, Politologia V, (Wroclaw University Press,1992), 9-21. 'Die 'sarmatischen Brüder' der Polen. Schlesien aus polnischer Sicht im 16. und 17. Jahrhundert', (The Poles Sarmatian Brothers. Polish Views of Silesia in the Sixteenth and Seventeenth Century), Kulturpolitische Korrespondenz, Stiftung Ostdeutscher Kulturrat, 737 (Bonn, 1989), 4-6. 'Preface', 'Royal Entries into Cracow, Warsaw and Danzig: Festival Culture and the Role of the Cities in Poland-Lithuania', as well as the edition of source texts in form of an anthology of eleven festival descriptions (1543-1754) with annotations, in the original languages (German, Polish and Latin) and in English translation, in: Europa Triumphans. Court and Civic Festivals in Early Modern Europe, ed. By J.R. Mulryne, Helen Watanabe-O'Kelly, Margaret Shewring, Elizabeth Goldring and Sarah Knight, 2 vols, 500 pp. each (Ashgate, 2004), ISBN 07546 38731, vol. I, pp. 373-374, pp. 386-392, pp. 394-462 (source texts). 'Facing Both Ways: New Work on Prussia and Polish-Prussian Relations', German History 15, no. 2, 1997, pp. 256-267. 'Biala legenda czarnego krzyza' [The white legend of the black cross], in: Mówia Wieki: Magazyn Historyczny (February 2002), pp. 11-15. In 2014-15 I have led an outreach-public engagement project, Linking Northern Communities socially, culturally and economically: East European Immigration in Scotland, funded with £ 18,000 by the Scottish Universities Insight Institute, based at the University of Strathclyde (http://www.scottishinsight.ac.uk/Programmes/Programmes20142015/LinkingNorthernCommunities.aspx). I have also been in cooperation with the Institute for Reformation Studies at the University of Warsaw, funded by the Polish Science Foundation, on Universal Reformation http://www.ibi.uw.edu.pl/pl. As part of the Centre for Early Modern Studies, I have been involved in several funding applications, such as an application within the HERA Collaborative Research Project Balancing Diversity and Community: 17th-Century Politics and Media Practises(with the University of Paderborn, Germany) and a publication project with the University of Warsaw and the Instytut Bada? Literackich on 'Political Discourse in Poland-Lithuania in Dialogue with the European Tradition'. and the Northern European Renaissance (ed. Pietro Omodeo in collab. with K. Friedrich, forthcoming spring 2016) I am also an active member of and PhD supervisor for the University's Centre for Citizenship, Civic Society and the Rule of Law (CISRUL) http://abdn.ac.uk/cisrul/. I have regular collaborative and advisory contacts with projects at the Palacky-University in Olomouc(Czech Republic), the Zentrum für Historische Kulturwissenschaften der Johannes Gutenberg-Universität Mainz and the East European History at the University of Halle (both Germany). In 2002-2004, I took part of an AHRB-funded project on East European travel literature (London), a Leverhulme-funded project on European political thought (Hull), and an AHRC-funded project 'Europa Triumphans' (Warwick), all of which resulted in publications. Appointed member of the Peer Assessor College of the Carnegie Trust (2014-). External Examiner in History at the University of Dundee (2008-12) and at the University of Stirling (2011-2014). Coordinator of the Postgraduate Taught Programme (MLitt) in Medieval and Early Modern Studies; Member in the Research Committee, Member of the University Senate, and responsibility for student tutees (graduate attributes). Deputy Head of School (Divinity, History and Philosophy) for History (2012-15), member of School Executive, Research committee, with responsibilities for mentoring and annual review of staff members, teaching programmes, PGR review, workload model. Before 2012: coordinator of all taught postgraduate degrees in History, member of the postgraduate committees of the school and the college, member in the Induction Strategy Group of the unversity, academic staff mentoring coordinator for the college, school liaison officer for History and Student Advisor.